President Obama released his 2015 budget proposal on Tuesday, and the best way to understand it is as a campaign-strategy memo to return Nancy Pelosi as Speaker of the House. After the rude four-year interruption of a GOP House, Mr. Obama is revving up the tax and spend engines to turn out Democrats this fall and change the debate away from ObamaCare. One of the President's more amusing fiscal sleights-of-hand is his claim that the federal government has been enduring "austerity." Taxpayers should be so lucky. 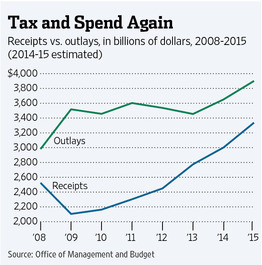 The nearby table shows the arc of tax revenues and spending during the Obama Presidency, and you can see they are both up. Washington has rarely had it so good. The feds spent $2.98 trillion in 2008 and Mr. Obama is proposing to spend $1 trillion more than that in fiscal 2015. The Pelosi-Obama stimulus blew out the bank in 2009-2011, the GOP House imposed a modicum of restraint in the next two years, but Mr. Obama is going back to the Pelosi future from here on out. His budget would increase outlays by nearly $450 billion from fiscal 2013, and almost none of it for defense. Spending in 2015 would hit 21.4% of GDP, up from 20.8% in 2013. Outlays would rise by another $1 trillion by 2020, much of it fueled by the exploding costs of ObamaCare, and would reach an astonishing $6 trillion by 2024. If Democrats do take the House and Senate, you can bet spending will rise even faster. Mr. Obama's budget nonetheless says that the deficit will fall to $564 billion in 2015, or 3.1% of GDP. How would that happen? Well, because tax revenues are booming. Revenues hit $2.77 trillion in 2013—a new federal record—and the Obama budget foresees them growing another 20%, to $3.33 trillion in fiscal 2015. Receipts will hit 18.3% of GDP in 2015, well above the 40-year average of 17.4%, and they'll keep rising to 19.9% a decade from now. But Mr. Obama says the government is starved for revenue and thus any tax reform must raise another $1 trillion on top of all this.